We’re afraid of the woods. We likely always have been—the Brothers Grimm may have collected wooded tales of witches, elves and wolves both big and bad during the 1800s, but those stories had been passed down for generations. Those who told the old fairy tales saw the forest as a mysterious place of wonder, temptation, confusion and danger. Writing/directing team George Popov and Jonathan Russell follow that same bumpy trail into the woods with their first feature, Hex. Made on little more than a thousand dollars, Hex proves the duo to be a competent set of craftsmen and effective storytellers. Two soldiers separated from their companies in the 17th century during England’s Civil War chase each other into a deep forest. The rebel Thomas (William Young) is young, soft and open to the dark poetry and doom of witchcraft. He’s not long in the woods before he sees his true enemy is not the countryman behind him with his sword drawn. Richard (Daniel Oldroyd) fights for King and Country, strident and single-minded, logic keeps him from believing until he has little choice. 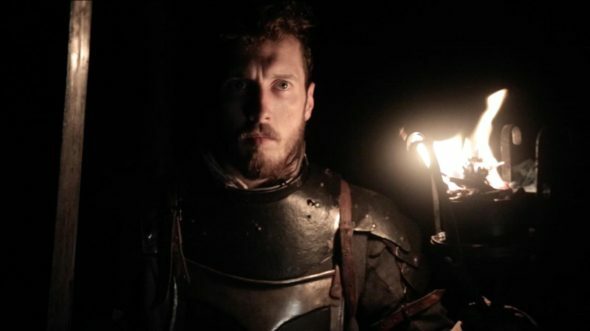 Hex draws quick comparisons to Ben Wheatley’s 2013 experiment A Field in England, but where that film felt fanciful and indulgent (though entertaining), Hex feels a bit more like a stage play taken to the woods. The film is slow-moving, sometimes frustratingly so. Though Popov and Russell’s technical skills are solid, their instincts for pacing and tension-building are less honed. The slight plot relies immensely on an atmosphere of supernatural dread for its success, but it’s here that the filmmakers have some trouble. The flaw is hardly insurmountable. Even with sometimes obvious budget restrictions, the film looks good. Popov and Russell let light from a campfire spark the imagination, edging frames with shadowy dangers. Hex sounds great, too, working the nerves with the effective noise of blades unsheathed or the diabolical tinker of a nearby brook, all enriched with Nino Russell’s appropriately bewitching score. There is more happening here than you realize, and it’s to the filmmakers’ credit that you only recognize the film’s purpose when they are ready for you to do so. The result is a satisfying tale with more power than just magic.